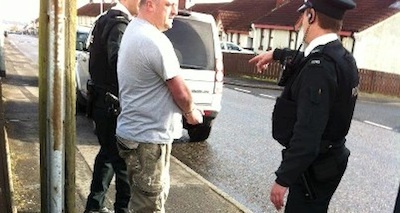 Gary Donnelly, Anthony Lancaster and a third man were arrested after a raid on their homes. PSNI tactical support groups were said to have “taken the houses apart” while looking for materials linked specifically to the 32 County Sovereignty Movement (32CSM). Warrants presented by the police during the raids specifically named the organisation, a peaceful political campaign founded 13 years ago. As a condition of their release on bail this afternoon, the men were banned from attending, organising, participating or assisting any political meeting, protest or event. They must also sign bail twice on Easter Monday, the anniversary of the famous Rising against British rule during which Ireland’s independence was proclaimed. The organisation said the treatment of its membership was a serious abuse of civil rights and contrasted the PSNI’s actions with the ‘kid gloves’ approach taken to loyalists involved in the recent flags riots. “The dilution of Human and civil rights laws seem to be acceptable now amongst those now shoring up the British institutions”, they said. Now the people of Derry were being asked to “close their eyes, to turn the other cheek as the bullyboys of the RUC with the backing of Stormont, discriminate and attempt to bully the families and children of Republicans. The three men have been subjected to extensive police harassment in recent years, with Mr Donnelly suffering serious injury in the course of one “arrest” three years ago. The 32CSM said this week’s policing actions were designed to be “punitive” against those opposed to the status quo and amounted to political and sectarian “apartheid”. “The British Government, their quislings in Stormont and their bootboys in the RUC rely totally on the blind eye being turned, the media censorship and inaction of the public to continue to discriminate against in targeting one section of the Community,” they added.